Summer 1953: The CIA and British intelligence hatch a plot for a coup that overthrows a democratically elected government in Iran intent on nationalizing that country’s oil industry. In its place, they put an autocrat, the young Shah of Iran, and his soon-to-be feared secret police. He runs the country as his repressive fiefdom for a quarter-century, becoming Washington’s “bulwark” in the Persian Gulf -- until overthrown in 1979 by a home-grown revolutionary movement, which ushers in the rule of Ayatollah Khomeini and the mullahs. While Khomeini & Co. were hardly Washington’s men, thanks to that 1953 coup they were, in a sense, its own political offspring. 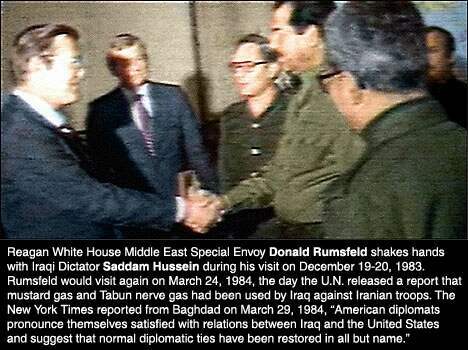 In other words, the fatal decision to overthrow a popular democratic government shaped the Iranian world Washington now loathes, and even then oil was at the bottom of things. 1967: Under the U.S. “Atoms for Peace” program, started in the 1950s by President Dwight D. Eisenhower, the Shah is allowed to buy a 5-megawatt, light-water type research reactor for Tehran (which -- call it irony -- is still playing a role in the dispute over the Iranian nuclear program). Defense Department officials did worry at the time that the Shah might use the “peaceful atom” as a basis for a future weapons program or that nuclear materials might fall into the wrong hands. “An aggressive successor to the Shah,” went a 1974 Pentagon memo, “might consider nuclear weapons the final item needed to establish Iran’s complete military dominance of the region.” But that didn’t stop them from aiding and abetting the creation of an Iranian nuclear program. The Shah, like his Islamic successors, argued that such a program was Iran's national “right” and dreamed of a country that would get significant portions of its electricity from a string of nuclear plants. As a 1970s ad by a group of American power companies put the matter: “The Shah of Iran is sitting on top of one of the largest reservoirs of oil in the world. Yet he’s building two nuclear plants and planning two more to provide electricity for his country. He knows the oil is running out -- and time with it.” In other words, the U.S. nuclear program was the genesis for the Iranian one that Washington now so despises. September 1980: Iraqi ruler Saddam Hussein launches a war of aggression against Ayatollah Khomeini’s Iran. In the early 1980s, he becomes Washington’s man, our “bulwark” in the Persian Gulf, and we offer him our hand -- and also "detailed information" on Iranian deployments and tactical planning that help him use his chemical weapons more effectively against the Iranian military. Oh, and just to make sure things turn out really, really well, the Reagan administration also decides to sell missiles and other arms to Ayatollah Khomeini’s Iran on the sly, part of what became known as the “Iran-Contra Affair” and which almost brings down the president and his men. Success! March 2003: Saddam Hussein is, by now, no longer our man in Baghdad but a new “Hitler” who, top Washington officials claim, undoubtedly has a nuclear weapons program that could someday leave mushroom clouds rising over U.S. cities. So the Bush administration launches a war of aggression against Iraq, which like Iran just happens to -- in the words of Deputy Secretary of Defense Paul Wolfowitz -- “float on a sea of oil.” (Bush officials hope, in the wake of a “cakewalk” of a war to revive that country’s oil industry, to privatize it, and use it to destroy OPEC, driving down the price of oil on world markets.) Nine years later, a Shiite government is in power in Baghdad closely allied with Tehran, which has gained regional strength and influence thanks to the disastrous U.S. occupation. So call it an unblemished record of a kind not easy to find. In more than 50 years, America’s leaders have never made a move in Iran (or near it) that didn’t lead to unexpected and unpleasant blowback. Now, another administration in Washington, after years of what can only be called a covert war against Iran, is preparing yet another set of clever maneuvers -- this time sanctions against Iran’s central bank meant to cripple the country’s oil industry and crack open the economy followed by no one knows what. And honestly, I mean, really, given past history, what could possibly go wrong? Regime change in Iran? It’s bound to be a slam dunk and if you don’t believe it, check out Pepe Escobar's latest "The Myth of 'Isolated' Iran". Tom Engelhardt, co-founder of the American Empire Project and the author of The American Way of War: How Bush’s Wars Became Obama’s as well as The End of Victory Culture, runs the Nation Institute's TomDispatch.com. His latest book, The United States of Fear (Haymarket Books), has just been published.